Posted under Health Guides. Updated 22 November 2016. Milk allergy is different from lactose intolerance. The protein in milk is what causes an allergic reaction. Allergic reactions include hives, itching, and anaphylaxis. If you are allergic to milk, plan ahead and carry an Epipen®. What are some of the symptoms caused by an allergy to milk? A milk allergy can cause skin reactions such as swelling of the lips, mouth, tongue, face, or throat. It can also cause hives, a rash or redness, and itchy skin or eyes. Respiratory problems such as sneezing, nasal congestion or runny nose, coughing or wheezing, and asthma can also result from a milk allergy. The most serious allergic reaction to milk is called anaphylaxis (an-uh-fa-lak-sis). Anaphylaxis happens suddenly and involves dangerous changes to your breathing, heart rate, and other body functions. Anaphylaxis also occurs when several different symptoms occur together, such as getting a rash and wheezing, or stomach pain and swelling of the throat. Anaphylaxis usually happens within seconds to minutes of exposure to an allergen, such as milk, and is life-threatening without emergency medical treatment. If you or someone you know has ever had a serious allergic reaction after coming in contact with milk or a milk product” use the EpiPen® injector and call 911 right away! Because anaphylaxis can be unpredictable and potentially life-threatening, you must always carry your EpiPen® with you. No, milk allergy is different from lactose intolerance. Milk allergy is an allergic reaction to milk proteins, and lactose intolerance is the inability to digest the lactose sugar found in milk. 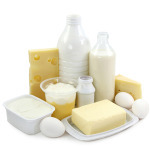 The symptoms of lactose intolerance are usually diarrhea, cramping, and gas. If you have a milk allergy, do not consume lactose free products as they likely contain the milk protein you are allergic to. A milk allergy can affect people of all races and ethnic groups. Most people develop milk allergy when they are infants and outgrow their allergy as they get older. A small number of people do not outgrow a milk allergy and remain allergic to milk as adults. Milk allergy does not usually develop later in life. Read food labels and stay up-to-date with food products. Every now and then food manufactures change their labels. Even if you eat a certain product all of the time, remember that the ingredients can change. Purchase deli meats with caution. Cross-contamination can occur when meats are sliced on the same equipment used to slice cheese. Prepackaged deli meats can also contain milk proteins in the brines that surround the meat. Most food manufacturers list a 1-800 number on the back of their products that you can call to find more information. If you’re allergic to milk, try not to get discouraged. Your health care provider can give you a prescription for epinephrine in case you do have an allergic reaction. As you learn more about your milk allergy, you’ll know what foods to avoid and will be able to choose a variety of new foods to keep you healthy. Quiz: Do I get enough calcium in my diet?